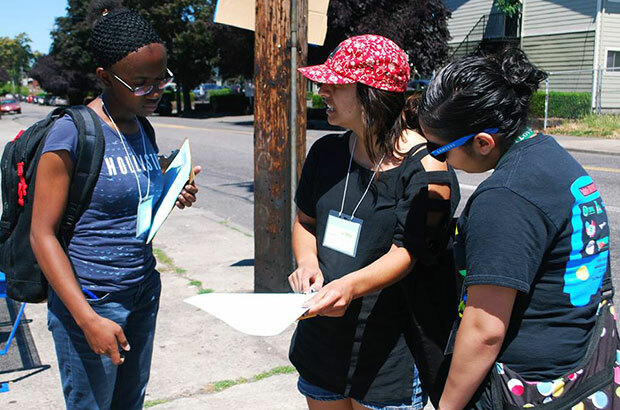 Young people in Oregon care about the environment, and are concerned about their future. But most youth, particularly youth of color and youth from low-income families, are not inspired by the mainstream approach to environmental conservation and carbon reduction. The urgency of the moment is being washed away by the daily struggle to maintain, let alone aspire and advance. Public transportation is a lifeline to opportunity for many youth in Oregon. Transportation is also the primary source of carbon emissions in the state. The future of our climate movement will depend on cultivating the next generation of transit riders. Youth are making their priorities known. Now it’s up to us to recognize and seize this opportunity for transformative change. In February of 2011, OPAL Environmental Justice Oregon (OPAL) and Bus Riders Unite! (BRU) launched the Campaign for a Fair Transfer, an effort to increase the time-based fare for cash and single-ticket riders. OPAL builds power for environmental justice and civil rights in our communities by organizing low-income communities and people of color to achieve a safe and healthy environment where we live, work, play and pray. BRU is a movement by and for transit riders to achieve a more equitable transportation system and hold TriMet accountable to the needs of their most loyal customers. With leadership from transit-dependent riders and a commitment to ensuring access to service and decision-making, BRU adheres to longstanding Civil Rights and environmental justice principles. After nearly four hard-fought years, transit justice advocates and leaders finally secured the TriMet board's support in late 2014 to increase the time-based fare by 30 minutes, effective March 1, 2015. The Campaign for a Fair Transfer was a priority for low-income riders, who comprise a majority of cash/ticket riders and were feeling squeezed by unprecedented fare hikes and successive service cuts. An extra thirty minutes goes a long way. Low-income riders, especially “trip-chaining” riders (predominantly women, immigrants, caretakers) using transit to take care of every day needs, will clearly benefit from more time. But it's the potential to attract more "choice riders" that makes transit justice even more transformative and critical to our future climate health. People with options will take advantage of the extra time too. Minneapolis/St. Paul saw a 9% boost in transit ridership when they extended to 2.5 hours, and there's no reason to think that folks in our metro region won't take advantage too, boosting TriMet ridership, increasing firebox revenue, decreasing vehicle-miles traveled and carbon emissions in the process. TriMet is listening, but increased ridership, especially for short trips that can be completed in under three hours, is the best kind of reinforcement. The lesson here is that what is good for equity is often what's good for the climate and for everyone. Equity really is a superior growth model, precisely because it's inclusive, with less externalized costs. They key to shifting normative behavior and lasting progress on climate change lies in a more just society, and Bus Riders Unite are leading the charge. Fortunately there are plenty more creative, equitable strategies within reach. Increased performance efficiency for the bus system (think bus jump lanes and signal prioritization), is key. Keeping prices down and service up, especially on evenings and weekends, is also key. But perhaps the best opportunity we can jump on is to work with emerging youth leadership around a regional YouthPass program that can serve as a model for the rest of the state (and country). By providing free transit passes and ensuring robust service in and around high schools, we will increase youth access to opportunity, reach diverse working families across the state, save tens of millions in education funding as we shift away from yellow bus service, and activate thousands more choice riders who will take advantage of service enhancements, increasing overall ridership. And if we're successful, we will have mobilized a new generation of transit riders for future leadership on environmental and climate justice in Oregon. Transportation accounts for 40% of all carbon emissions in the state. There is simply no climate solution in without real investments in public transit. We can find this sweet spot and develop a truly broad and diverse movement by serving those most vulnerable to climate impacts while also providing carbon-reducing incentives for everyone. 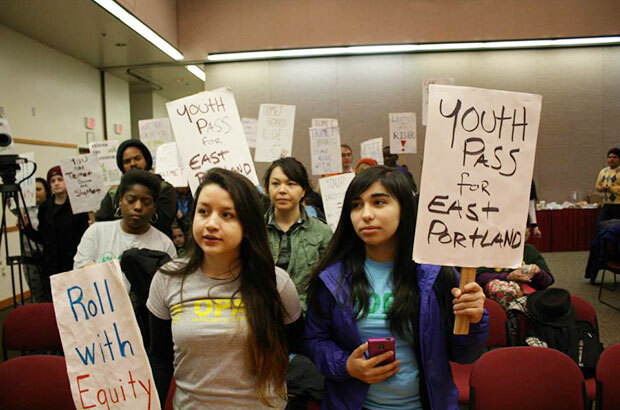 Let's get behind HB 2979, the Youth Transit Initiative, and start building toward our shared goals. Jon has worked on environmental justice issues since arriving in Portland in 2000 to attend Lewis and Clark Law School. While a law student, Jon worked as an organizer under Jeri Sundvall-Williams for the N/NE Portland community-based Environmental Justice Action Group, where he met OPAL co-founder Kevin Odell. Jon worked as a civil rights and employment discrimination attorney for five years before leaving private practice to help build OPAL, becoming Co-Director in January 2010, and Executive Director in January 2012. Jon continues to practice law, advocating on behalf of disenfranchised communities and developing state environmental justice law and policy, and is currently an Adjunct Professor at both Lewis and Clark Law School and Willamette University College of Law, specializing in Environmental Justice, Sustainability and Civil Rights Law and Policy. Share your clean energy economy solutions story! We'd love to hear the story of your success with the clean-energy economy. Want to share?